(4) Figures to the right indicate full marks. 1 (a) A two-dimensional flow field is given by u=2y2; v = 3x. Find the acceleration at point A (-2,4). (6 marks) 1 (b) Pressurized water fills the tank and hemispherical dome given in the figure below. Compute the net hydrostatic force of water on the dome. (6 marks) 1 (c) Does the following potential represent possible flow? If so determine the stream function and plot the streamline Ψ=1. Φ=y+ x2- y2(6 marks) 1 (d) Convert 12560 Pascal's (absolute) into mm of mercury gauge. (2 marks) 2 (a) The cylinder shown in the figure is 2m wide. Compute the horizontal and vertical components of the force due to water on the cylinder. A reservoir stores water to a height of 12m. A horizontal pipe of 10cm diameter and 50m length, connected at the base of the reservoir, carries water from the reservoir. The entrance to the pipe is sharp with a loss co-efficient of 0.5 and the pipe has a friction factor of 0.018. Calculate the discharge through the pipe for steady conditions. 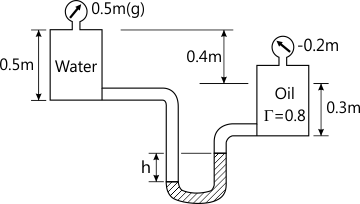 If a nozzle of 50mm outlet diameter and a cv value of 0.92 is connected to the exit of the pipe., by what percentage does the discharge vary, assuming other conditions to be the same. (14 marks) 4 (b) Define stream function and velocity potential function. Prove that streamlines and equipotential lines are normal to each other in a flow field. (6 marks) 5 (a) For the U tube manometer shown in the diagram below calculate the difference in the mercury column in the two limbs. (8 marks) 5 (b) Gate is 7m wide and weighs 30,000 N when submerged. It is hinged at B and rests against a wall a smooth wall at A. Determine the water level 'h' at the left which will cause the gate to open.